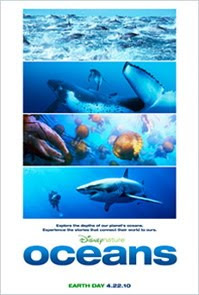 The latest Disneynature film, Disneynature Oceans, arrives in movie theatres on Earth Day, April 22, 2010. It sounds promising...although it is a bit too early to know for sure. The only advance review that I could find was by blogger Collider.com who saw an advance showing at the Tokyo International Film Festival and who said that it was a good film and that he has seen the BBC's Planet Earth. In case you don't understand the innuendo, I assume that his reference to Planet Earth is because of the uproar about Disney's re-use of Planet Earth material in it's first film, Earth. I enjoyed Disneynature's Earth, it was beautifully done. However, I had not seen the entire BBC's Planet Earth series. All the reading I have done on those two films, however, would lead to two recommendations on my part. If you HAVE seen Planet Earth...you might care to take a pass on Earth. However, if you HAVE NOT seen Planet Earth and are not interested in viewing the whole series, Disneynature's Earth is a beautiful choice. Meanwhile, just a few days remain until the release of Disneynature's Oceans. Disney is, once again, making a contribution to help the environment. This time, they will be making a contribution for every individual who attends the movie from April 22nd to 28th toward protecting the coral reefs. If you are planning to see the film at the movie theatre and you go in that time frame, you will also be making a small donation to help the environment. I'm looking forward to another beautiful nature documentary film. How about you? Read more about Disneynature's Oceans. Dare to Compare Disneynature's Earth and Planet Earth. Order your copy of Disneynature's Earth on sale at Amazon. Order the BBC's Planet Earth series on sale at Amazon.